If you're trying to figure out when bitcoin's slump will end, you may want to look at the emerging markets. According to Fundstrat Global Advisors' Thomas Lee, there's an important correlation budding between emerging markets and bitcoin, the most dominant coin in the cryptocurrency space." "Both really essentially peaked early this year, and they both have been in a downward trend," the firm's head of research said Friday on CNBC's "Trading Nation." 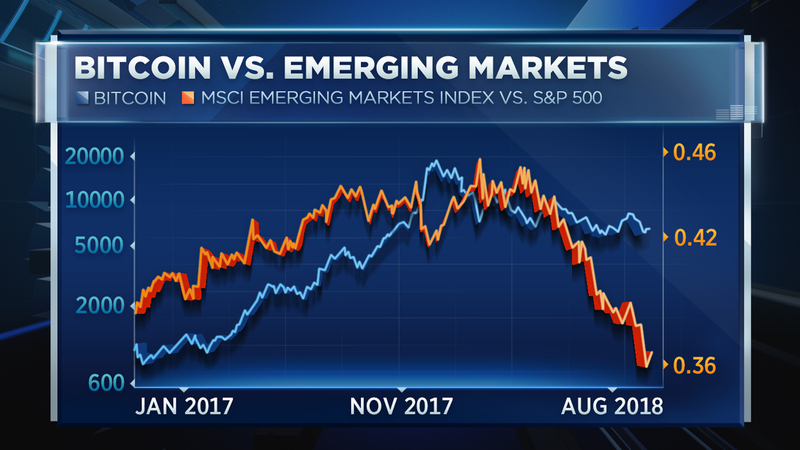 "Until emerging markets begin to turn, I think in some ways that correlation is going to hold and tell us that sort of the risk on mentality is those buyers aren't buying bitcoin." The iShares MSCI Emerging Markets Index ETF is down about 8 percent so far this year. It's painful, but not as much as the epic bitcoin sell-off. Bitcoin's buying frenzy came to a virtual screeching halt shortly after reaching a record just show of $20,000 last December. Since then, the cryptocurrency has fallen by 65 percent. It's now trading in the $6000s since August 8. Lee contends hedge funds aren't buying risk when emerging markets sell-off. The recent trading activity suggests they aren't buying bitcoin either. But that bearish trend could be about to end. Lee, who owns bitcoin and has been among the biggest bulls on Wall Street, sees the tide changing in favor of both areas of the market — especially if the dollar weakens and the Federal Reserve slows its interest rate hike policy. He also points out there's big money and firepower on the sidelines in the cryptocurrency space. Those factors could help bitcoin surge to $25,000 as 2018 winds down, according to Lee. "I still think it's possible," said Lee. "Bitcoin could end the year explosively higher."